Thank you all for coming back yet again for our third Humble Brag of the year. I really enjoyed each and every project that was linked up and appreciate you taking the time! For more information on how to do this, two twenty one wrote great post with pix on how to do it! This is a super simple and really adorable project from my friend, Karah at the Space Between. I pretty much love everything that Karah does, so this was a no-brainer choice for me! 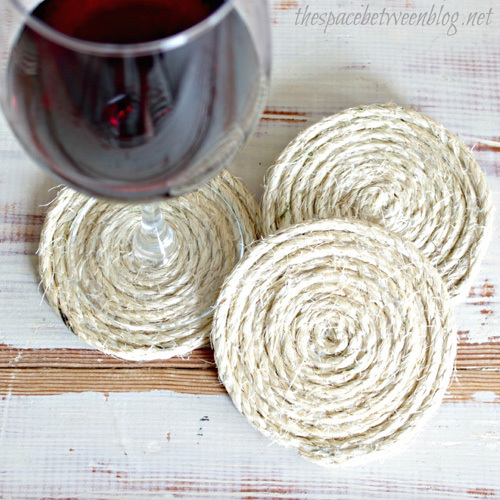 I think I am going to add these DIY coasters to my gift list this Christmas! Art is Beauty was a featured blog last week, but she just keeps linking up these amazing projects! Who new an ugly old 70s side table could look this good? I guess, she did! 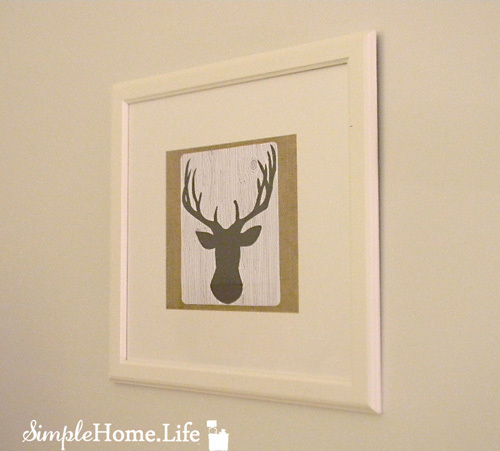 I’m not usually one for deer decor, but I do love this $4.25 artwork from Simple Home. Life. 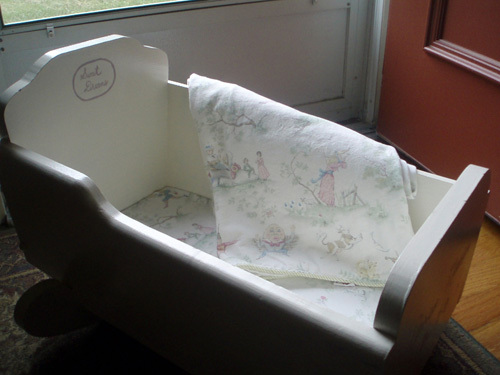 Decorum DIYer refinished this baby cradle to be a Pottery Barn knock-off. Boy, do I love knock-offs! This was Christine’s very first link party and we felt honored to have her! Admittedly, I am loving pallet art these days and this dandelion wall art really inspires me. Seriously, if DIY Diva experiences a theft, I might need to be questioned! 🙂 This wasn’t previously announced, but DIY Diva will receive free advertising for the next week in our sidebar! woot woot! 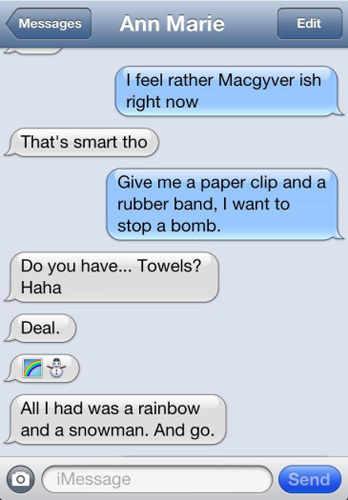 The Humble Brag is all about encouraging one another in our pursuits (and sometimes even fails). We’re excited to see what you have been up to in your crafting/DIY world. We also welcome recipes and other projects. I will be visiting each and every link over the coming day or two, so bring it on! 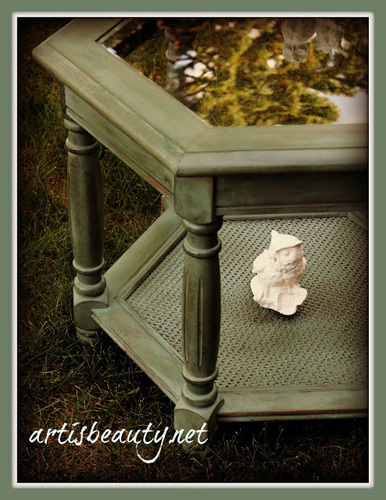 Thank you oh so much for featuring my 70’s end table makeover! Our pleasure…thanks for linking up and coming back! You’re doing great Christine! Thanks so much for linking up!!! WOW the dandelion wall art is amazing. I love it! Thanks so much for inviting me…love you blog. I will add your party to my list. Following you now too! Thanks Sarah and thanks for linking up. Hope to see you back next week too! Thanks for the invitation to the party! What a fun blog you have here! Have a great weekend! Thanks so much for linking up Tanya!! Love the dandelion wall art! Absolutely gorgeous! Thanks for linking up and I just followed you on FB! Hey Tanya! Thanks so much for linking up and can’t wait to have you back! Thanks for inviting me to the party. Great projects here filling me with inspiration! Hey Emily! Thanks so much for visiting and linking up! Hope to see you back again! Hey Mary Beth! Thanks again for linking up. Hope to see you back again! Thank you so much for hosting and for the invite! All linked up 🙂 Have a great weekend! Thank you, thank you for the feature!! I am in love with that dandelion pallet art!! Have an awesome weekend!! Yay, glad you saw it, Karah! You have gotten lots of compliments and hopefully you’ve seen some traffic. Thanks again for linking up!! thanks for the invite! you sure have some great features! Jocie thank you for inviting me! Hey Anne, Thanks for much for visiting and linking up. Looking fwd to seeing you again on Friday! 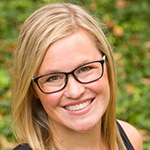 Hey Liz, Thanks so much for coming and linking up! I’m always grateful when someone appreciates one of my “more fun than framing in a wall” projects! I feel appropriately humbled that you featured mine this week, since a lot of fabulous projects linked up… Will definitely be checking back in for more humble brags. Hey Kit, So glad you saw you won and thanks again for linking up. Hoping to see more DIY Diva projects in the future!